You can edit your different chat notification settings, including desktop notifications, notification sounds, and offline messages and Zendesk Chat update notifications. These changes will only affect your account, not your agents'. For information on changing your other profile settings, see Editing your personal settings in Zendesk Chat. You can enable or disable chat notifications from appearing on your desktop. Notifications will only appear when Chat is not visible and your browser settings allow the dashboard to show notifications. From the dashboard select Settings > Personal > Sounds & Notifications tab. Click the checkbox next to each notification setting to enable or disable them. Click Save Changes at the bottom of the page when you are finished. The dashboard alerts you of chat activity with sound notifications. You can modify or disable these in your personal settings. From the dashboard, select Settings > Personal > Sounds & Notifications tab. In the Sounds section, select the alert you want to receive for each type of event. 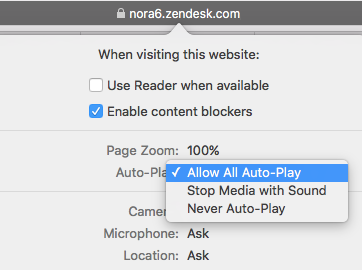 If you are using Safari web browser, your sound notifications might be automatically blocked. These Safari settings can also block notification sounds for end-users on the Chat widget. On your Zendesk Chat dashboard, right click on the URL address bar. In the Auto-play settings drop-down list select Allow All Auto-Play. By default, every agent on your account automatically receives all the messages, but you can opt out from the dashboard. From the dashboard, select Settings > Personal and click the Profile tab. In the Preferences section, deselect the Offline Message Notification option Receive messages that visitors leave on my website when I am offline. You can also opt out of receiving periodic product update emails from Zendesk Chat. By default, this option is also enabled for all agents. In the Preferences section, deselect the Zendesk Chat Updates option Receive periodic email updates from Zendesk Chat. There's a way to setup the chat sound appears just to the online agent, thats receives the chat request? Here's the chat employees are complaning about everyone hear the chat sound, even if they're not reciving the chat request! Hi Fernando! Welcome to the Community! I just want to make sure I understand what's happening here. Are your agents getting the chat notification sound on their own computers (through their headphone or speakers? ), even though they're not getting the chat request? Or are they just hearing the sound coming from someone else's computer? Thats right. They're getting the chat notification sound on their own computers (through their headphone or speakers.